1Preheat the oven to 350°F. In a small-medium saucepan, bring the dates to a simmer with 1 1/4 cups water. Remove from heat and stir in the baking soda. It will foam up - make sure you have room. Pour into a bowl and set aside to cool. 2In a large bowl, beat the butter and sugar together until sandy; add the eggs and vanilla and beat until pale and light. In a small bowl, stir together the flour, baking powder and salt. Add half the dry ingredients and stir (or beat on low) just until combined. Stir in the date mixture and pear, then the remaining dry ingredients, stirring just until blended. 3Pour into a well buttered Bundt or similar shaped pan and bake for 40-45 minutes, until deep golden, cracked on top and springy to the touch. Let cool on a wire rack, and invert onto the rack or a plate while still slightly warm. 4To make the sauce, bring the brown sugar, cream and butter to a simmer in a medium saucepan over medium-high heat, whisking often. Remove from the heat and stir in the vanilla or bourbon. Set aside to cool. 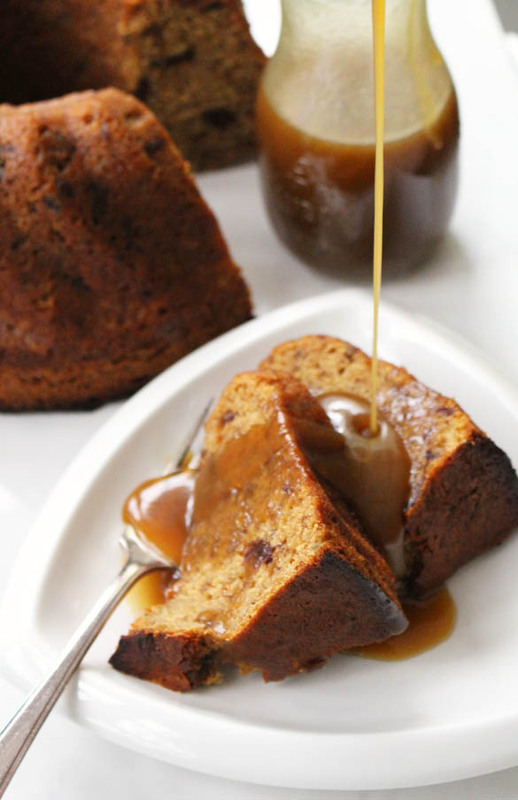 5Serve the cake topped with caramel sauce, with whipped cream or ice cream.